Men’s Fashion Week just recently ended in Milan, leaving us with the inspired looks for Spring-Summer 2015. Heavy hitters like Bottega Veneta and Zegna took to the runways along with a slew of top houses all of which stuck to specific themes for this year’s crop of shows. For instance, Italo Zucchelli’s take on Calvin Klein showcased underwear as outerwear (i.e., he allowed longer boxer brief legs to peek from underneath pairs of shorts). At Prada, designer Neil Barrett took to the male form with a modular note with rounded shoulders & squared waists. And Masimilliano Giornetti kept things simple for Ferragamo by sticking to his penchant for urban wear with a chic polish. Of particular interest to me was the Moncler Gamme Bleu show. For the fashion neophyte, Moncler is a French-Italian clothing company that was founded in 1952 primarily as a manufacturer of quilted sleeping bags. They soon conceived quilted jackets for workers to stay warm in the cold, and eventually a wider range of outer wear emerged for the likes of mountaineers and skiers. Now, Moncler is a luxury brand that has extended its reach to haute couture collections and more. 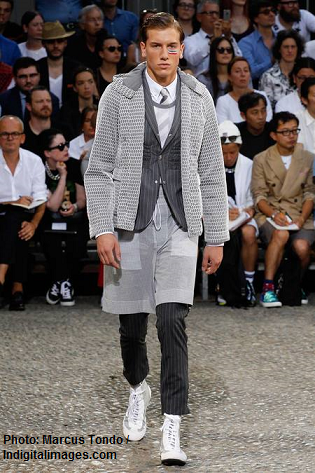 The Moncler Gamme Bleu collection is a menswear line composed by American fashion designer Thom Browne. Browne, who is also at the helm of his namesake fashion brand for men and women in New York, can trace his humble beginnings to his creative development experience at Club Monaco –a brand of the Polo Ralph Lauren Corporation—where he led its design department before launching his own label. Browne joined with Moncler in 2008 to gear-up for the brand’s Winter 2009 collection. The collection has since been presented at Milan Fashion Week. For his Spring-Summer 2015 show, Browne took elements of boxing wear and gear, and used them as inspiration (and actual pieces!) for the collection. The show, which was presented in a coliseum-esque setting, featured an actual boxing ring surrounded by bleachers of spectators. The space between bleachers and the ring served as the show’s circular runway. Noah Johnson, who covered the show for style.com, indicated that Browne merely just “picked” the boxing theme as the season’s inspiration. The looks included boxer’s robes, high-waisted trunks, and even laced-up boots paired with the designer’s sleek pants, trousers, shirts and jackets. The show included womenswear as well, and while it was a woman’s gown that was showcased as the show’s finale piece, it was the menswear that packed the most punch. (After all, this was for men’s fashion week.) With seersucker suits, light tweed bits, and other well-positioned key items all cleanly mangled with the look and feel of a fighter’s minimalist ensemble, Moncler Gamme Bleu’s Spring-Summer 2015 line was a pound-for-pound winner. See the show, and other great fashion videos from FatalefashionIII on YouTube.